Central Jakarta Maritime Agriculture and Food Tenacity (KPKP) Sub-dept. 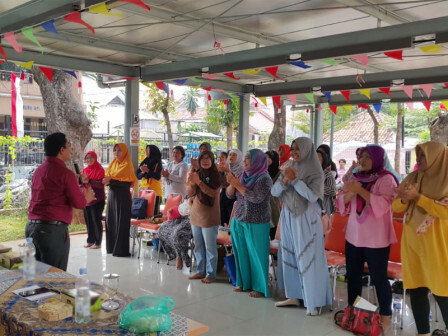 holds training for public empowerment at Pandawa RPTRA, Tanah Tinggi Urban Village, Johar Baru.
" We give training to families with food insecurity in order to increase business capacity in processing agricultural product"
"We give training to families with food insecurity in order to increase business capacity in processing agricultural product. There are 30 people participated in this training," mentioned Bayu Sari Hastuti, Central Jakarta KPKP Sub-dept. Head, Thursday (8/23). According to him, Tanah Tinggi residents will be trained for 10 days or until September 5. In this training, participants practice to process agriculture food products in 15 recipes, learn theory of entrepreneurship, OK OCE basic training, business permit, and capital. Meanwhile, Tanah Tinggi Urban Village Head, Sutami conveyed, those 30 residents are from RW 5, 11, 3 and RW 9. They have been selected by KPKP Sub-dept. to get this training. "Hopefully they ca n follow this training completely thus they can become independent, tough, and success entrepreneurs," he expressed.